You could say that ever since the town of Gibraltar was captured in the name of Archduke Charles, back in 1704, the Province was always likely to be on the LEYTR Editors' 'places to do' list. For since then, the town of Gibraltar, famed for its 1,400-ft high rock and Barbary apes, has remained a dependant territory of the UK. We have always been fascinated that there can be such a British state situated in the hinterland of the Mediterranean, availing itself of all associated with such a prized location. Having never really researched the rocky road (sorry) that shapes the present-day Gibraltar, we had wondered whether or not we'd be in for many shocks and surprises once we landed. We knew that the main road into the peninsular crosses the Province's runway; that the Police wear a uniform identical to that seen on the streets of the UK; that traditional red pillar boxes, served by the Royal Mail, are used throughout; and that a near-identical currency is employed: the Gibraltar Pound. We also knew that Gibraltarians remain fiercely loyal to the UK (though this may be since the only alternative sovereignty is Spain) and that the Province has been - and continues to be - a real source of diplomatic tension between the UK and Spain. With temperatures here in Blighty having been so low for so long, and with the 2009-10 winter being recorded as the coldest in 30 years, the prospect of a few days' worth of relatively milder weather, coupled with an excellent deal from airline operator easyJet, helped make our minds up! And so it was that, last Friday - 5 March - m'colleague and I boarded the 0610 East Coast service from Peterborough to London King's Cross. It's such a shame that an earlier departure from within Lincolnshire to the Capital isn't possible. Happily, though, we were able to cadge a lift from the mother of an LEYTR Associate. I'd not been on a train since last October, on a day when I caught this self-same train to London, in order to review the new West Coast Main Line route, courtesy of Virgin Trains. I may well have ended the longest period of my adulthood without having stepped foot on a train! East Coast is both the name of the franchise and the name of the operating company while under state control. Richard Branson's Virgin Trains looks likely to be the first to show its willingness to bid for the franchise when invitations to tender are requested in the summer. As with my last journey, today's 0610 departure from Peterborough travelled empty from East Coast's Bounds Green depot in North London, arriving in very good time so that it conveniently dwells to enable a drip-fed style of boarding. It was very civilised and convenient last October and I'm please to report it was today, too. Today was also the first time we'd both travelled on the nationalised East Coast rail franchise, managed by the Department for Transport's Directly Operated Railway company. We departed punctually and were soon trundling through Holme (the lowest point in Britain) and headed towards Huntingdon. With spring approaching, the lighter mornings really make a difference. Despite the temperature hovering tantalisingly close to freezing, the prospect of three days in temperatures in the region of 18°C really lifted our spirits. Our journey was punctual throughout and we arrived at London King's Cross a minute early. 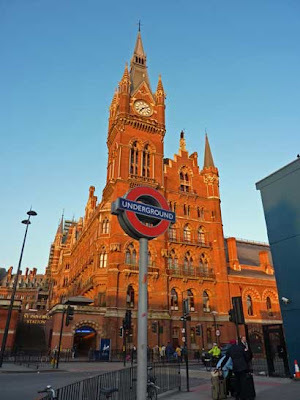 The walk between King's Cross and St. Pancras International can be done without the need to go outside, though as we had time to kill we traversed the streets of London, capturing the frontage of St. Pancras basking in glorious morning sunlight. We did witness a new request from the guard, though, which was to ask all passengers in Standard Class not to walk through First Class in order to alight at King's Cross. Apparently, passengers in Cattle Class (paraphrasing sentiments made by Anne Widdecombe this week) make their way into First long before the train has arrived at King's Cross in order to alight nearest the concourse. First Class coaches always face London on the East Coast franchise and accordingly passengers therein have less far to walk. So high are the numbers of displaced passengers that the on board crew have problems setting up for the next journey, so now First Class cannot be used as a time-saving method. Our journey had been propelled by the only Class 91 electric locomotive to have gained the erstwhile National Express East Coast livery - on this occasion being 91111. Our flight to Gibraltar departed from Gatwick North at 1000, with departure gates closing at 0930. 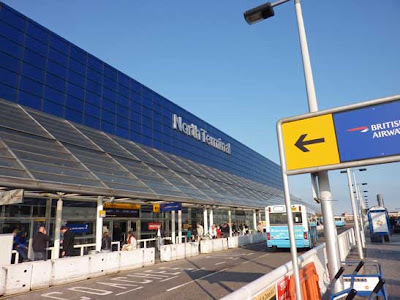 Since neither of us were travelling with luggage for the plane's hold, we weren't too bothered about arriving with hours and hours to spare, so opted to travel to Gatwick Airport using the Thameslink route, rather than the more expensive Gatwick Express service. 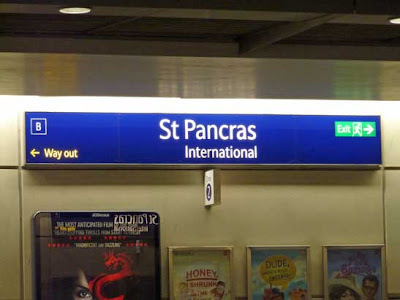 That said, once on board the 0748 departure from St. Pancras' Thameslink subterranean station, I soon mused that the end-to-end journey time was comparable with that afforded by the Gatwick Express - especially when the requirement to travel from King's Cross to Victoria was factored in. Seen here at Gatwick Airport is on of FCC's Electrostar '377s'. 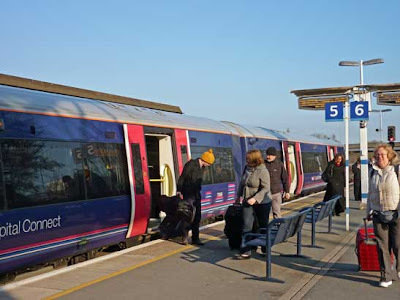 Luggage provision isn't anything to write home about, though when faced with the thousands who use the service to commute into London from either Brighton or Bedford, it's not a high priority. Although we crossed the Thames at 0800, our Bombardier-built Class 377 'Electrostar' was very lightly loaded and had been as it arrived at St. Pancras. A fair few had left here, but the journey was far from the nose-to-arm-pit standee experience I'd been expecting. St. Pancras International's platforms for Thameslink trains has been built with the route's upgrade very much in mind - 9-car trains are dwarfed by the platform length. The platforms are very deep, too, and while we were there the spaciousness this created was very calming - you'd never have guessed that it was bedlam above. We did realise, though, that by catching the 0748 First Capital Connect Thameslink service, with its 0840 arrival at Gatwick, we probably didn't want to be cutting our arrival at the departures gate any finer than we already were. I'd Googled the transportation means between the South Terminal (where the train station is located) and the North Terminal, and found that the usual inter-terminal shuttle train was out of action while it was being overhauled as part of a package of improvements to both terminals totalling £1 billion. 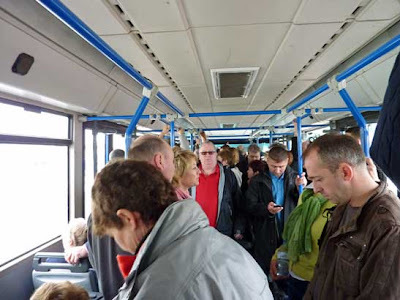 Instead, a shuttle bus service would operate and 'around 20 extra minutes' needed factoring into our transfer. 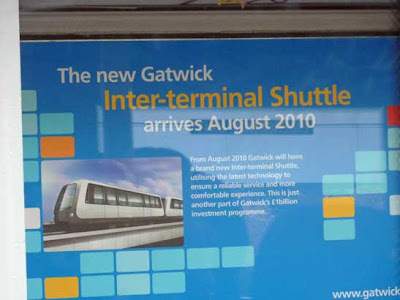 Normally the inter-terminal shuttle service links both North and South terminals, though this is currently undergound overhaul and upgrade and is due to re-open during August. Though in the event everything went as smooth as it was conceivably possible for it to be. Our journey from home to the airport was absolutely flawless. Signage was both obvious and plentiful in directing passengers to where the shuttle buses leave from and once here (the South Terminal bus station - just down from where NX coaches leave) there were people on hand to ensure efficient use of the vehicles. It really was a model trip by public transport - and so far, we'd both paid £17.85. 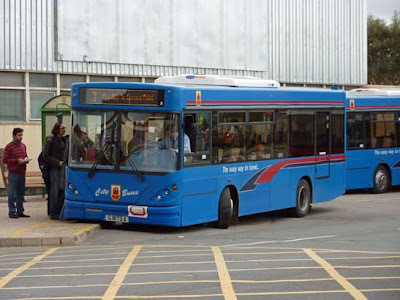 There were three Dennis Dart SLFs parked at the South Terminal, awaiting passengers to transfer to the North Terminal. Having never flown from the latter, we were both very impressed with the welcome and ambiance. And things continued in the same, impressive vein throughout the embarkation process onto one of easyJet's Airbus A319s, docked at Gate 106. Our departure was at 1000 and in keeping with easyJet's check-in policy, the departure gate would close 30 minutes before this time. Gatwick North is very much newer than its southern counterpart and more spacious - this vastness never more in evidence than when actually walking to a departure gate - especially number 106. It was displayed at 0918 and off we all trundled along a corridor, headed in that direction; however, it took two slightly unfit adult men, both devoid of luggage, save a ruck sack each, nine minutes to reach the departure gate - and this saw us take full advantage of the travelators. The two Virgin Atlantic planes in the background are actually docked at the South Terminal - such is the expanse of both North & South that they meet. In the foreground is the wing of the plane on which m'colleague and I were sat. A plane can be seen coming into land in the top right-hand corner. Technically, then, we arrived at the departure gate three minutes before easyJet could officially deny us access and yet made our way very briskly and without hindrance the second the gate was displayed. As it was, we were about mid-way in the queue once we arrived and around 70-or-so people congregated behind us. Check-in didn't start until 0930 in any case. It was the first time both of us had flown from Gatwick North and the same for boarding an easyJet plane using a proper, enclosed bridge. So often boarding an easyJet or Ryanair plane is from the tarmac. Boarding via a standard bridge appears to be the norm at Gatwick North, and it was very welcome. Once inside, we had a choice of seats - 156 to be precise - all arranged in the standard 3+3 formation. I chose to have a window seat on the outward journey and m'colleague elected to have one when we returned. A very unusual experience is shown here - all eastJet flights from Gatwick North use movable bridges to load and unload passengers. Normally you walk onto the tarmac in order to board. 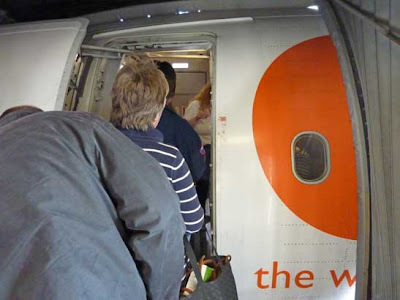 easyJet's boarding policy has altered slightly since November 2008. Previously, those who'd booked Speedy Boarding were allowed to board first, followed by those in boarding group 1 and finally boarding group 2. Boarding group 1 comprised the first 34 people to check-in, of which the majority were those without hold luggage, and boarding group 2 was everyone else. During 2008, Speedy Boarding Plus was introduced, which offers travellers a dedicated check-in service at many airports used by the company. Now, Speedy Boarding and Speedy Boarding Plus travellers are checked in together (including travellers with children under the age of 5) and everyone else is allocated boarding group 2 status. I've never really had any cause to complain about the level of service I've received by easyJet, and I assume its sister no-frills airlines have near-identical operational protocols. All stewards/stewardesses are incredibly friendly and polite - though not to the point that sycophancy creeps in. Who'd have thought that bright orange shirts would look reasonably trim and, dare I say it, fashionable! Having taken our seats, we were given the full safety drill - unbelievably while the young woman sat next to m'colleague was texting her boyfriend - and at 1002 were we began taxiing to the runway. The take-off is an experience that I very much enjoy. It's one that many people detest, though. There are lots of anxious faces as the captain engages maximum thrust and you're sent hurtling along the runway at 160mph. I've flown on five occasions - Alicante, Almeria, Belfast, New York and Inverness - and never tire of the experience. I've grown accustom to looking out of the window 20 seconds or so after take-off and witnessing the horizon at 45° and not being unduly alarmed, though one thing I find very awkward still is when a turn is made - especially at relatively low altitude. I vividly remember my descent into Inverness Airport requiring a very low-altitude 180° turn over the Moray Firth. Course, m'collaeage isn't affected by this one jot and found it all most entertaining. 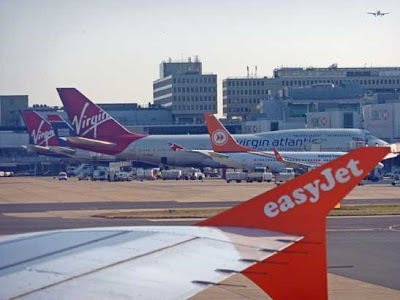 The Airbus A319 is the plane of choice for easyJet, who in 2003 placed an order for 120 of these planes, which was seen as the largest plane order in modern times. The company has 107 in service today, with an order for a further 227 ongoing. easyJet also operates the highest number of this type, with US Airways coming in second-place having 93 operational and 114 on order. 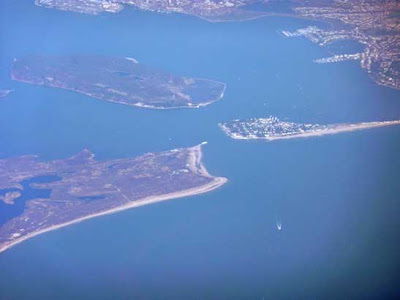 We flew west from Gatwick and while over the New Forest headed south and left Britain over a very familiar coastline, that of Sandbanks and Brownsea Island. In the distance the peninsular linking Portland Bill to Weymouth was also visible. During 2007 m'colleague and I visited a bus rally in Weymouth and made a visit to Portland Bill aboard a number of vintage buses. So far as I'm aware, Portland Bill is the name of the lighthouse, which sadly was unrecognisable from this altitude. From here, we headed over northern France for a time and then Guernsey before the Bay of Biscay. We then headed over northern Spain and then south-east over Malaga before bearing west along the Costa del Sol, where Gibralta came into view. Sandbanks - reputedly the most affluent area in England - can be seen at the end of the peninsular on the right. To the left is technically the mainland, too, though travels right the way round Poole Harbour, which can be seen in the background. A chain ferry links both Sandbanks and the Studland area opposite and a tiny white speck can be seen in the gap, which I believe to be the ferry itself. Here is Portland, at the end of the Portland Beach Road peninsular. 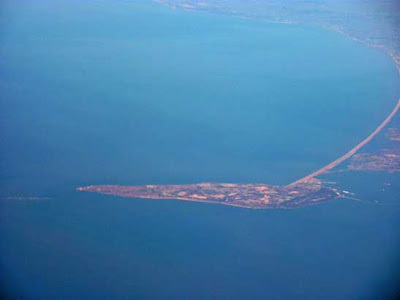 The lighthouse is situated at the far right of the photo - the southernmost tip - though can't be seen. Prevailing westerly winds are the norm along the Mediterranean, though owing to the 1,400-ft grantic mountain that overwhelms Gibraltar, the winds can, at times, be from a different direction. Strong, eddying currents can be found directly over the Province's runway, and I'm glad I didn't spot the following video before travelling! Today, then, an easterly wind was being felt and so we had to land into it, which meant heading in from the west, so we circumnavigated the rock, turning tightly at low altitude (wonderful) before coming to land on the runway - which is an experience like no other. The close proximity of the plane to, well, everything - cruisliners, hotels, cars, water - is such that it provides real insight into how the captain has to get everything precisely right! From my research, I knew Gibraltar's runway was actually longer than the land on which it was built, so overhangs into the bay somewhat. I also knew, that at the opposing end (due east) was the Mediterranean Sea, so wanted to ensure we stopped as soon as possible! An aerial shot of northern Gibraltar, where the Province's runway can be clearly seen to be longer than the land on which it is built is wide. We landed from the west. 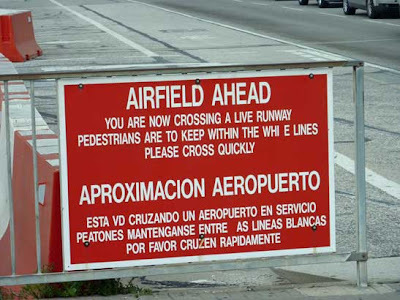 The yellow crossing the runway is in fact Winston Churchill Avenue, the main road in and out of Gibraltar. Just when you think that the most surreal landing you're likely to endure is over, you notice that on either side of you are cars queuing at red and white barriers, waiting to cross! The reality of a road - Winston Churchill Avenue (no less!) - crossing a live runway was very evident now. And how odd it was! The advantage of the runway (and airport's) proximity to the population meant that walking into the centre of town was no problem at all. Unless you're headed to Spain, you have to cross over the runway in order to do so and first-time visitors are identifiable by their willingness to pose next to the skid marks left by a Boeing 737. Wonderful signage can be found along Winston Churchill Avenue! 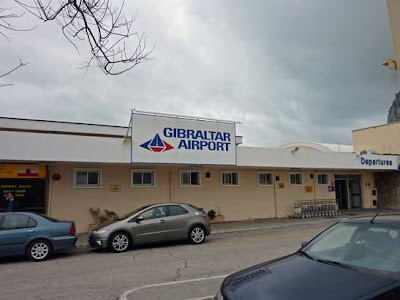 As you leave the airport, you are stood opposite Gibraltar's bus station. It is comprised of a large, deep bay with two bus shelters. Publicity is not the Gibraltar Bus Company Limited's strong point. A linear-style route map is produced, but precious little else. Most shelters we found displayed the map and details of bus service operation on Boxing and New Years Days 2009, though one did display what we assumed to be an up-to-date timetable, albeit crudely stuck to the shelter with super-glue. More on this later. A Caetano Nimbus-bodied Dennis Dart MPD is seen here in Gibraltar's bus station, conveniently located opposite the airport and adjacent to the Frontier (Spanish border). 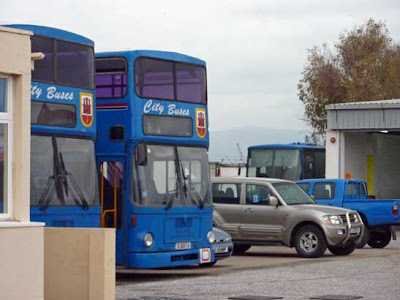 Five bus routes operate in Gibraltar - four are run by the state-owned City Buses (Gibraltar Bus Company Limited), Services 2, 3, 4 and 9, while the remaining Service 10 is operated by Euro Hopper (Calypso Bus Company Limited). The City Buses fleet comprises 18 Dennis Dart MPDs with Caetano Nimbus B27F bodies; a couple of Toyota Hiace minibuses are also used on Service 2 and we also spotted a coach and two elderly double-deckers parked at their depot, which is behind the bus station. There is no travel office. Calypso's Euro Hopper service operates just one route between the bus station (airport/Spanish border) and the coach park to the west. This company has a fleet of ageing double-deckers from Germany - a couple were Neoplan Starliners in a red (London?) livery. Calypso is the face of entrpeneurism in the Province. 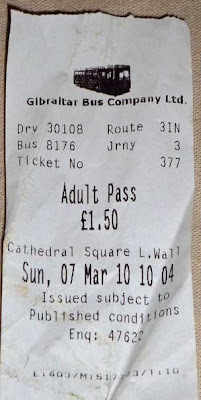 During our time in Gibraltar we made use of a number of bus services and took full advantage of the very low fares - a single fare on either operator's services is 60p; a day ticket on City Buses is £1.50 (4 routes) and on Euro Hopper it's £1.20 (1 route). 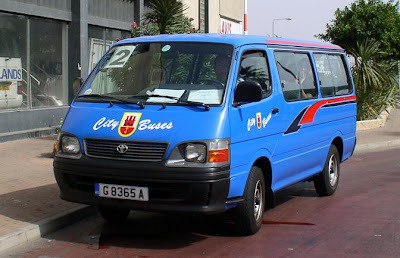 Throughout our time in Gibraltar, we only ever saw City Buses operate their Darts, which were introduced on 10 April 2004. The entire fleet of 18 Dennis Darts was introduced then, providing 100% low-floor operation throughout the Province in one fell swoop. They replaced much smaller, Transit-style buses and were a much-needed improvement. City Buses uses Wayfarer ticket machines. One of our day tickets is seen here - a great buy at just £1.50. Until October 2001, Gibraltar's vehicle registration plates all began with a G followed by up to five digits. Now, they continue to start with G, though followed with a number from the range 1000-9999, followed by a letter. 'A' is allocated to the first batch from 1000-9999, 'B' for the second, and so on. During our time there we spotted registrations such as G 8622 C, but never any ending in D, so the Province hasn't exceeded issuing 27,000 registrations just yet! The City Buses' registrations all ended in 'A', so form part of the first 8,999 to be registered when the system was introduced. Although the Darts don't carry a visible fleet number, they appear to be referred to as the four-digit number in their registrations. The nationalised bus network in Gibraltar. We made use of all routes, except Service 2. There is no railway in Gibraltar and those without a car either arrive by coach, plane or ship/boat. The harbours are numerous, though most cruiseliners bringing day-trippers dock at the main ferry terminal, nestled just south of the runway. An alternative location for the even larger vessels bringing tourists is the Gibraltar Cruise Terminal to the far west. Those affluent enough to own their own boats and yachts make use of two docks - the Queensway Quay Marina and the Marina Bay. One thing Gibraltar has proportionately less of is beach. Four main beach areas exist, though all are limited: Eastern Beach starts where the easternmost edge of the runway ends; a little further down is Catalan Bay and then Sandy Bay. Major building work is taking place in these areas, with new hotels and holiday apartments being added. They offer excellent views of the Mediterranean and Costa del Sol, though have the 1,400-ft rock in their back gardens. This side (east) does feel a little more cut-off from Gibraltar than elsewhere. It is impossible to circum-navigate the rock by road. City Buses' Service 3 operates to the most southerly point - Europe Point, from where Morocco and Tangier can be seen across the Strait of Gibraltar. There are a couple of very tight turns along the route south, most notably when turning left from Main Street into Govenor's Lane. Any bus larger than this would simply not be able to undertake such a tight turn. City Buses' Service 4 links the eastern side of the Province with the far west, which is where the greatest concentration of English can be found. It is also where Gibratar's only supermarket - Morrisons - is located. The route passes the coach terminus, home to Calypso Travel, where their fleet of ex-German double-deckers is housed - along with some open-top examples, though inoperable in March. One of a number of ex-German double deckers operated by Calypso Travel under the Euro Hopper name. Only one route is operated by this company, linking the airport with the coach park for 60p single, 90p return or £1.20 unlimited. 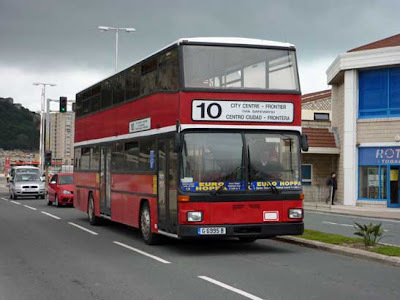 Their service would be the route of choice for hardened bus enthusiasts as they still employ a Leyland Olympian. City Buses operate a couple of Toyota Hiace people-carriers on Service 2, which links Moorish Castle with the city centre. Two ageing double-deckers can be seen here. They didn't move all weekend, nor did the coach in the background. 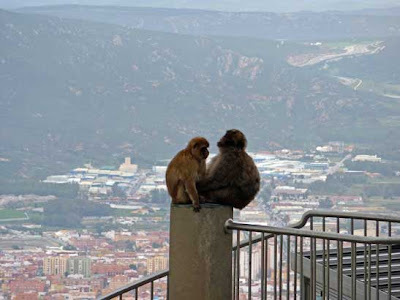 A trip to Gibraltar is nothing without meeting the Barbary Apes at the rock's summit. There are in fact two summits to the rock - the most northerly houses military equipment and is accordingly off-limits; however the southern peak is where tourism flourishes. 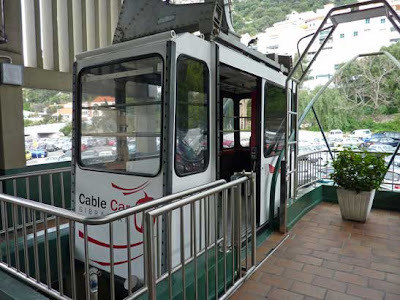 A cable car links terra firma with the top. We made use of this 1960s installation within hours of arriving, as we knew rain was forecast the following day. The fare was £8 return, though £10 if you wanted access to the nature reserve at the summit. We were both willing to forgo nature for a £2 saving - and in any case, no sooner had we stepped out of the cable car, we were greeted by the apes. The implication on the ground is that the apes are only visible in the nature reserve. This is not the case. There are two cable cars running at any one time, travelling almost to the 1,400-ft summit. We felt the £8 return fare was reasonable. Taxi drivers offer a more personal service for £20. The Barbary Apes have popularised Gibraltar because they are unique to Iberia. They are not the only troops in the world though. Detailed descriptions of the main apes are to be found in frames on some of the visitor centre's exterior walls, where we learned the Barbary Macaque is native to Morocco. The views from the top of the rock are excellent. We could see for miles despite there being an annoying haze. The rock's military summit would regularly be engulfed in low cloud, though only for a minute or two before clearing to reveal the Spanish horizon in the distance. Neither of us really knew what to expect at the top of the rock and can happily report that anyone uneasy at the prospect of being in close proximity with the apes should rest assured: they're very dosile and just don't seem interested. The Barbary Macaque are not afraid of hights - below is Gibraltar and in the distance, some 1,400 feet below, is Spain. We returned to Blighty on Sunday afternoon. We conveniently walked to the airport, though had visited there earlier in the day to witness a Monarch Airlines plane take-off from this truly fascinating and unique locality. Our easyJet plane departed at 1510 and the departure gate closed at 1440. Due to a delay earlier in our plane's schedule for the day, we were delayed by 1:05. There wasn't much to do once airside. Luckily Gibraltar's staple TV stations mirror those here in the UK, with the addition of some Spanish ones at the end of the list, so a repeat of Only Fools & Horses on UK TV Gold was in order. 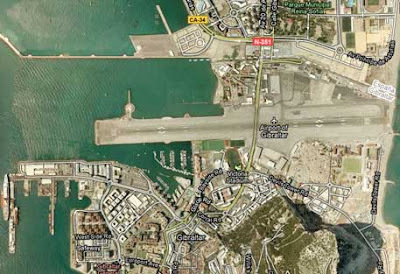 A completely unassuming airport is to be found at Gibraltar. A new terminal building is currently being constructed next door. Plans are also well-advanced for a road underneath the runway, too. I absolutely love watchin human behaviour when at airports. Normal, respectible, well-mannered people can turn into selfish, desperate lunatics. The concentration of people sitting down was heaviest near the departure gate. No sooner had the first people caught sight of our plane landing, everyone stood up to form a queue. By chance, we were both sat in this area anyway, so joined the queue and eventually those with Speey Boarding et al were called forward. They were afforded a bus to themselves, which is fair enough. The next 60 or so were then loaded onto the next bus. Clearly, the driver knew how many he could fit on, but those already inside wouldn't move down. There was stalemate. A broad Cockney accent could then be heard exclaiming "Cor, I fink we're full up, mate". It fell on deaf ears. A lot of intense staring took place and those in the aisles finally realised that it was they who were holding everything up and begrudgingly moved down. 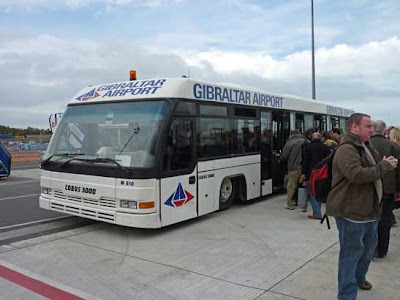 There are two airport shuttle buses at Gibraltar. Seen here is the scrum for the second one. From here we were taken to the plane and I could see men in suits ready to pounce as soon as the doors were opened. I even told m'colleague to look at how a couple of people reacted once they were allowed off. The most undignified spectacle of ageing, flabby men with suitcases bolting off the bus and running as fast as their legs would carry them was what we witnessed. It was so funny. There was also a point when regular fliers realised that it might actually be quicker to run to the back of the plane and climb aboard there. The scrum for the plane calmed while on board one of the shuttle buses. It soon resumed when the doors opened. Once enconsed within easyJet's Airbus A320, we awaited further passengers before we finally began taxiing for take-off. The terminal is to the east of the road and with an easterly wind blowing today, we had to taxi across the road to the furthest point west before turning 180 degrees and then the captain gave it the beans. Similar to the Monach Airways plane, the point at which we took off was as we passed the road. Once airborne, we were informed that the Senior First Officer was at the controls. 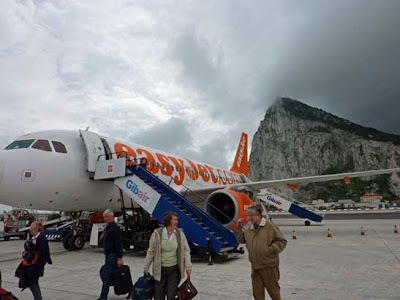 Flights from London to Gibraltar take about 2:45. You lose an hour flying out, but gain an hour returning home. Although temeratures in Gibraltar hadn't exceeded 14C all weekend, they were a far cry from the 1C we experienced in London. Another experience we endured was that of an American lady projectile vomitting at 36,000ft. Apparently, the desire to be sick came on so suddenly that she had no time to reach for the sick bag. The smell was quite something. However, amidst the ensuing hoo-hah, the dedication, patience and skill of the stewardess in dealing with it all was exemplary. She took her time with the ill lady, to ensure she wasn't suffering from any other unwanted effects and then helped her bag up all her soiled items. She then spent 40 minutes with antiseptic gel cleaning everything. After the American lady was taken ill, this was the only view I had so was able to watch the stewardess work tirelessly for 40 minutes, making matter right. An excellent job was done. From memory she was called Kerri (or 'kerri' as easyJet insist their name badges should look) and worked tirelessly througout. Unlike our southbound trip, we had only 3 members of crew - one less. Aviation law dictates that there must be 1 member of crew per 50 passengers. 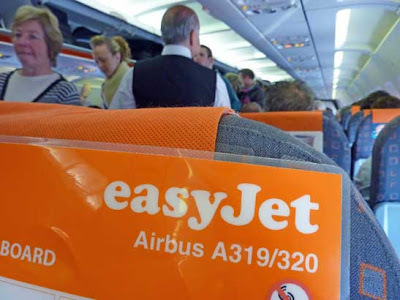 Our Airbus A320 had 156 seats, so 4 crew are needed; however, easyJet had 'taken out' six seats, lowering the aircraft's capacity to 150 passengers and thus only 3 crew were legally required. Before the vomit incident, service was fairly slow, though for the 40 minutes during which time our dedicated stewardess was on her knees scrubbing away, only 2 members of crew were serving the 140+ passengers. Neither m'colleague nor I purchased anything, so weren't affected directly. M'colleague made a shrewd (cheap) purchase before we travelled - and look at the expansion of said item once we were airborne. I told him to open the bag gingerly as a bang or pop could give the impression of a terrorist attack! I did think our landing at Gatwick was going to be decidedly bumpy, though in the event, it was very smooth. I made use of the biometric passport control when passing through customs. My passport was placed on a reader, which opened a gate into a holding area; I was then required to look at a camera, which compared the eyes on the passport photo to my own and I was then released. On this occasion, m'colleague's more traditional passport control experience was faster than mine, though when there's a queue and those with a biometric passport know the drill, it will be a massive boon. Within a decade, biometric passports will be the norm. We returned to St. Pancras using a First Capital Connect Thameslink service - this time a Class 319, which looked a lot more modern inside than its exterior appearance would suggest - and then made use of the Euston Flyer public house on Euston Road before out 2130 East Coast train to Peterborough left. 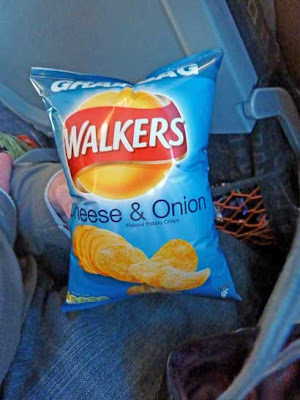 One comparison that needs making is the cost of beer in Gibraltar compared to the UK: since there is no VAT in the Province, two pints ALWAYS totals less than £5; the Euston Arms charged me £9 for two pints and two packets of crisps - that's 100 pennies more than a year's LEYTR subscription! !